Chestnuts are roasting, bells are ringing, and presents are under the tree. But if you are into survival, then you might put a slightly different twist on things during the holidays. I can help turn you into Survival Santa, with this guide to the most prepper Christmas around! But first, a word about disasters. No preparedness article would be complete without at least some reference to disasters. 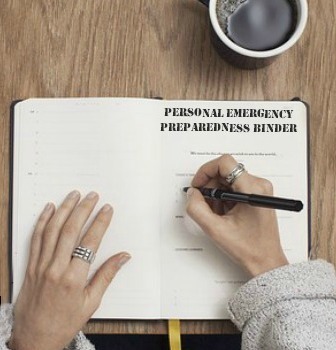 So here it is – whether you are traveling or hosting, a disaster during the holidays would have a whole new list of complexities beyond that of a less-people-y emergency. If you’re hosting and some event occurs that keeps people stranded at your home, here are some of the things you need to think about. Consider the personalities of your guests. Who is likely to be troublesome? Who is likely to NOT follow the safety rules? Who will whine like a little… incessantly complain? Who is going to be paralyzed with fright? Knowing these things ahead of time can help you to cut problems off at the pass before they affect everyone else. Do you have enough water for everyone? If the event was one that took out the water supply, would you be able to keep all your guests safely hydrated for the duration? You may want to add to your water supply. If the situation looks like it might go on for a while, you may need to dole the water out like a dictator, because wastefulness could pose serious issues. What’s everyone going to do for entertainment? I’m sure that your own well-behaved children would never whine, but what about your bratty nieces and nephews? (I’m just guessing, but it seems like every family has at least one kid who is spoiled rotten.) Have some things for kids (and grown-ups) to do to pass the time. Songbooks can be fun, as well as games, read-aloud stories, crafts, etc. Here’s a whole list of things to do when the power is out. What good is survival if you lose your sanity? And then there’s sanitation. Probably the worst of all possible scenarios would be one in which the toilet was not an option. Talk about the poop hitting the fan. Heaven forbid that this should happen, but if it does, have supplies for your human kitty litter box and learn how to set it up in this article. Be sure to provide detailed instructions to your horrified guests or someone will do it wrong and you’ll have quite the mess. Load up on baby wipes, hand sanitizer, and bleach wipes as well. If you’re traveling, the dynamic is different. You don’t get to be the boss of everyone like you would in your own home, but if things were really bad, people would probably want you to be. Bonus: You’d no longer be that crazy aunt or uncle and you’d actually be the cool one. If you’re traveling by plane, your options are limited. Really, the TSA doesn’t want you to survive. Let’s just get that one thing clear. But there are a few essential tools you can get past them that will help in an emergency. Here’s my list of TSA-approved survival items. Okay, “approved” might be a little bit extreme, but “tolerated” would work. If you’re driving, you can probably stash quite a few survival supplies. Hide them in your car until they’re needed and then you can be the hero of the whole gathering. I usually keep a bucket or two and my little emergency stove and fuel. Unless you’re going in an RV, you probably won’t be able to bring water but you CAN bring a portable water filter like the Sawyer Mini or the Lifestraw. The items in your auto emergency kit may also come in handy. Bring a solar phone charger. If you can keep the little hoodlums entertained by staving off device withdrawal, your hero status will be indisputable. (Okay, let’s be real – it isn’t just the kids who you’ll be making happy.) This nifty kit has a light, a power bank, and a USB charger. This gadget is just the phone charger. If you’re stocked like this, hopefully, the worst part of the crisis will be listening to the unprepared family members complain about how inconvenient it was of the electric company to let the power go out during Christmas. 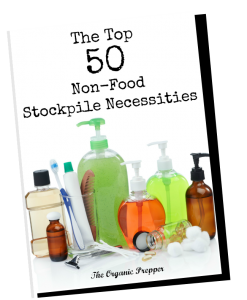 Here are some prepper Christmas gift ideas. Of course, it would be WAY nicer if your family could just be better prepared next year, wouldn’t it? Following, you can find all the gift guides I’ve written. Some will delight the preppers you love the most, while others will sneak some preps into the homes of the unsuspecting. Here’s how not to spend a zillion dollars. As much as many people love the holidays, it can get outrageously pricey. Being in debt afterward is a terrible way to start off the new year. So here are my best frugal holiday tips. Get my book, Have Yourself a Thrifty Little Christmas and a Debt-Free New Year right here in PDF format. And that is your guide to a very prepper Christmas. Maybe this will be the year that some of the people you love begin to see the light about getting more prepared. Heaven knows, we’ve had a year of evidence supporting the need to be prepped, what with hurricanes, wildfires run amok, and economic woes. Sometimes we can gently encourage them to get on board and it actually works. But trust me, forcing the issue rarely works and is much more likely to cause animosity than acquiescence. I hope that your holiday season is full of fun and that all visitors leave right on schedule as opposed to hunkering down angrily in the darkened living room of your home without their cell phones. But if you DO have to pull out the emergency supplies due to a poorly-timed winter storm that closes the roads and takes out the power, I hope that you’ll be ready.